Consider the degradation of a heat-labile compound during isothermal storage or exposure to a high constant temperature. Assume that this process follows Weibull kinetics. 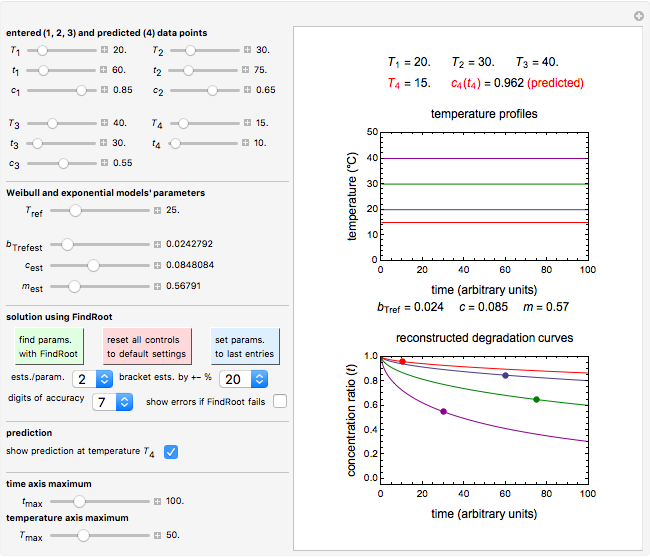 If the temperature dependence of the rate parameter follows the exponential model, a simpler alternative to the Arrhenius equation, then the compound's diminishing concentration is specified by three kinetic parameters. These can be extracted from three concentration ratios determined at three different constant temperatures at the same or at different times. 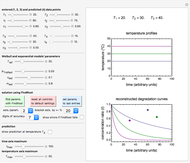 The solution of the corresponding three simultaneous nonlinear equations starts with an attempt to match three entered time-temperature-concentration ratio points with reconstructed degradation curves generated with the combined Weibull-exponential model. Once a match is found visually by using sliders, their positions provide estimates of the values of the corresponding parameters and/or proper ranges for the initial guesses that can be used in numerical solution of the equations. The kinetic parameters so obtained can then be used to reconstruct the entire three degradation curves at the three temperatures, and to predict the compound's degradation patterns at temperatures outside the observed range. is the momentary concentration ratio at time , is a temperature-dependent rate parameter (related to the scale factor in the Weibull distribution), and is a concavity parameter (the shape factor in the Weibull distribution), usually a constant or very weakly varying function of temperature . with , and the three unknowns. Being nonlinear, these equations require numerical solution, which, in turn, requires proper initial values for the FindRoot function to determine a solution. Obtaining these initial values by trial and error can be a daunting task, and a solution for experimentally determined concentrations is not always guaranteed. 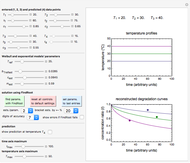 This Demonstration offers a convenient and rapid way to estimate the kinetic parameters and/or find initial values for their numerical calculation. This is done by generating three reconstructed degradation curves using , and values obtained by moving sliders on the screen until they match or approximately match the three entered (experimental) points. Once a match is obtained, the parameter slider's positions provide an estimate of their values. They can also be used as entered or multiplied by two factors, 0.8 and 1.2, for example, as the starting point or points for the FindRoot function to calculate the , and values that produce the best match. 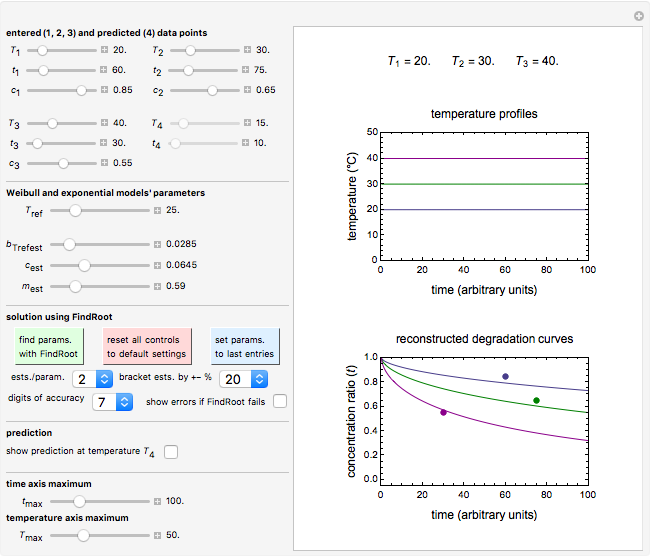 These estimated or calculated parameter values are then used to reconstruct the entire degradation curves for the temperatures , and and to predict the concentration at any chosen temperature not used in determining the parameters, assuming that the model holds at that temperature. To start, enter the three points, using their corresponding sliders at the top left of the panel. Then choose the reference temperature and move the , and sliders until a visual match is obtained between the three reconstructed curves and the three entered data points. Before or when this is accomplished, you can click the "find params. with FindRoot" setter to find the numerical solution of the three equations. If successful, the corresponding values of the parameters will be displayed between the plots and next to their sliders. Notice that for some entries FindRoot can find a solution even with the default parameter values, while for others no solution is possible. 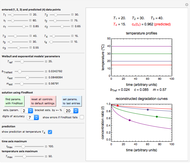 To choose a fourth temperature, click the "show prediction at temperature " checkbox to display the predicted degradation curve for that temperature, which will appear in red. 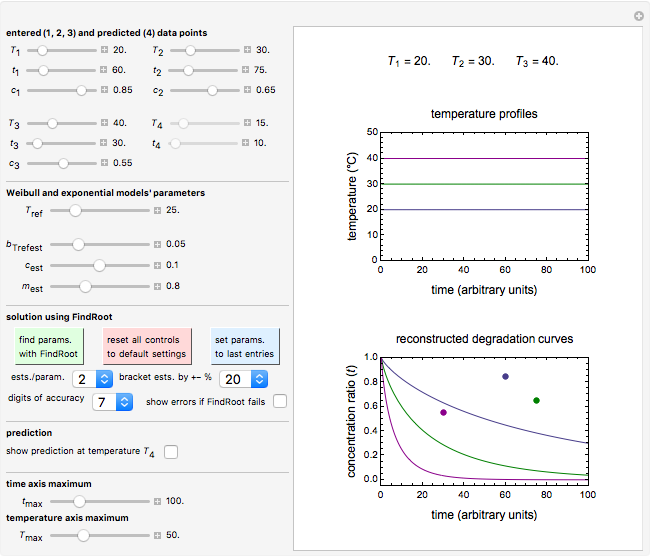 This will also activate the and sliders, which can then be used to calculate the concentration ratio at a chosen time and plot it on the predicted degradation curve. The numerical values of the chosen and corresponding concentration ratio will be displayed in red above the temperature plot and can be used to validate the model by comparing the prediction with an actual concentration. Use the lower two sliders to adjust the plot time and temperature axes maxima. Notice that not all allowed entries have a numerical solution, in which case the message "No solution with current entries." will appear in red. This, or failure to match the reconstructed curves, can be caused by errors in the entered data and/or the particular degradation reaction not following the assumed kinetic model. M. A. J. S. van Boekel, Kinetic Modeling of Reactions in Foods, Boca Raton: CRC Press, 2009. M. Peleg, M. D. Normand and M. G. Corradini, "A New Look at Kinetics in Relation to Food Storage," Annual Review of Food Science and Technology, 8(1), 2017 pp. 135–153. doi:10.1146/annurev-food-030216-025915. Mark D. Normand and Micha Peleg "Three-Endpoints Method for Isothermal Weibullian Chemical Degradation"